416 Beacon is located on the north side of Beacon, between Gloucester and Hereford, with 414 Beacon to the east and 418 Beacon to the west. 416 Beacon was designed by James T. Kelley, architect, and built in 1890-1891 by McNeil Brothers, carpenters, for Henry Howard Fay and his wife, Elizabeth Elliot (Spooner) Fay. He is shown as the owner on the original building permit applications, dated May 9, 1890, for the house and for a stable at the rear, and on the final building inspection report, dated October 23, 1891. 416 Beacon was built on the eastern 33 feet of a 60 foot wide lot that Henry Fay purchased on May 26, 1888, from Dudley L. Pickman. Dudley Pickman had purchased the land on January 25, 1887, from George Higginson, part of a 330 foot parcel he had purchased on January 14, 1884, from the Boston and Roxbury Mill Corporation. Henry Fay kept the western 27 feet vacant until 1897, when he built a new home on it, designed by James T. Kelley in a closely similar style to 416 Beacon. By the 1892-1893 winter season, Henry and Elizabeth Fay had made 416 Beacon their home. They previously had lived at 330 Beacon. They also maintained a home in Wood’s Hole, where he was the prime mover in formation of the Wood’s Hole Golf Club in 1898. 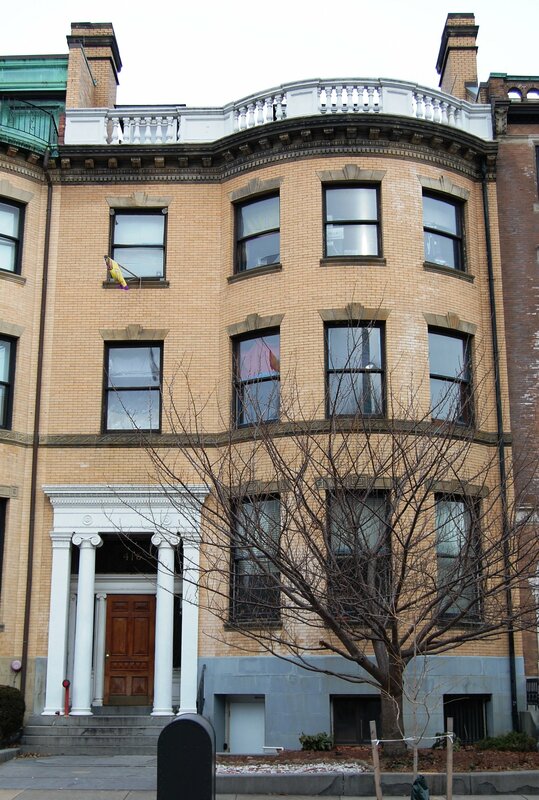 The Fays continued to live at 416 Beacon during the 1896-1897 winter season, after which they moved to their new home next door at 418 Beacon. On July 29, 1897, 416 Beacon was purchased from Henry Fay by Mary Rice (Farnsworth) Bremer, the widow of John Lewis Bremer. Prior to his death in January of 1896, they had lived at 49 Beacon. Their two unmarried children, Dr. John Lewis Bremer, Jr., a physician, and Sarah Farnsworth Bremer, lived with her at 416 Beacon. Their third child, Samuel Parker Bremer, a dry goods merchant, had married in November of 1896 to Mabel Burrage. They lived at 33 Bay State Road. John Lewis Bremer, Jr. married in September of 1906 to Mary Cleveland Bigelow. After their marriage, they lived at 18 Fairfield. On October 24, 1916, Mary Bremer joined with the owners of 418-426 Beacon in an agreement to “impose a uniform restriction on their estates which will prevent the erection of any building or other structure in the rear of any of the said estates which will further materially obstruct the light, air and prospect now enjoyed.” The agreement specified that, prior to January 1, 1937, no building more than one story high could be built north of a line 92 feet north of the building line established by City of Boston for Beacon Street (the building line required a 20 foot setback from the north side of Beacon). Mary Bremer died in December of 1916, and Sarah Bremer moved soon thereafter. At the time of the 1920 US Census, she was living at the Vista del Arroyo Hotel in Pasadena, California. On June 1, 1917, John Lewis Bremer, Jr., acquired 416 Beacon from his mother’s estate, and he and Mary Bremer made it their home. They previously had lived at 295 Marlborough. 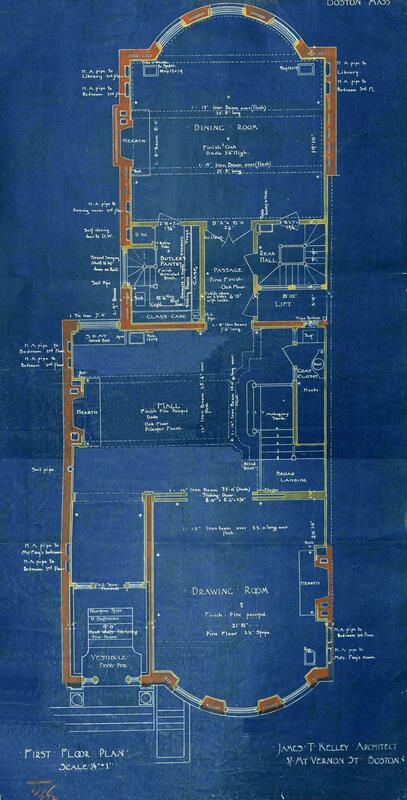 In April of 1917, prior to taking title to the property, he had applied for (and subsequently received) permission to remodel the interior of 416 Beacon. 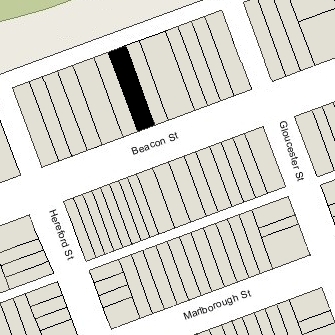 The Bremers continued to live at 416 Beacon until late 1927, when they moved back to 295 Marlborough for the winter and then to 113 Marlborough. On December 23, 1927, 416 Beacon was acquired from John Lewis Bremer by real estate dealer John D. McLaughlin, Jr. On the same day, he conveyed a one-half interest to Elliott Henderson, also a real estate dealer. 416 Beacon was not listed in the 1928 Blue Book. On March 19, 1928, 416 Beacon was acquired from John McLaughlin, Jr., and Elliott Henderson by investment banker Malcolm Whelen Greenough. He and his wife, Kathleen Lawrence (Rotch) Greenough, made it their home. They previously had lived at 294 Beacon. Malcolm Greenough died in May of 1948, and Kathleen Greenough moved soon thereafter. On July 20, 1948, 416 Beacon was acquired from Malcolm Greenough’s estate by Mary (King) Kennedy, the wife of William Edward Kennedy. They lived in Needham. On August 19, 1948, 416 Beacon was purchased from Mary Kennedy by Margaret Mary (Gilmartin) Grimes Ray, the wife of Harry Ephraim Ray, an engineer. They previously had lived in Newton. They continued to live at 416 Beacon until about 1952. On September 11, 1952, 416 Beacon was purchased from Margaret Ray by the Beta Nu House Corporation to become the fraternity house of the MIT chapter of Delta Tau Delta. It previously had been located at 255 St. Paul Street in Brookline. In July of 1963, the Beta Nu House of Delta Tau Delta applied for (and subsequently received) permission to remodel the property. As part of the remodeling, it legalized the property’s use as a fraternity (lodging) house. 416 Beacon remained the Delta Tau Delta fraternity house in 2017.